This full-body gym workout is a little different from my last one. This time around, we’ll start with a heart-pounding superset of leg exercises before moving into the more traditional lifts. You only need a brief light warm-up before getting started and should be able to complete this whole routine in under an hour. But that doesn’t mean that you won’t build up a sweat and get a good pump as long as you push yourself and make sure that every last rep is challenging. Pop in those headphones, turn on your favorite tunes and let yourself get lost in the movement. I recommend you complete this full-body workout 3 times per week and supplement with a few cardio sessions (like my cardio home workout videos). 1) Stand facing a box or bench. Step on the box using your right leg. Step down on the other side of the box. 2) Immediately perform a squat until your glutes lightly touch the box (or as low as you can go). 3) Turn around and step on the box using your left leg. Do a squat again on the other side of the box. Repeat for the desired number of reps.
1) Stand holding a dumbbell or weight plate with both hands. Have your arms extended but keep a slight bend in your elbows. 2) Raise the weight until your arms are parallel to the floor. Focus on lifting with your shoulders and keep the rest of your body as still as possible (no swinging). 3) Pause for a second at the top of the movement before slowly lowering the weight back down. 1) Stand holding a barbell with your hands at shoulder-width and your palms facing forward. 2) Bend at the waist while keeping the back straight until your upper body it is almost parallel to the floor. 3) Pull the barbell towards your chest while keeping your body steady. Keep the elbows close to your body and only use the forearms to hold the weight. 4) Squeeze your back muscles and hold for a brief pause at the top of the motion before slowly lowering the barbell back down to the starting position. 1) Attach a straight bar to a low pulley. Hold the bar with your palms facing each other and your hands shoulder-width apart Step back until the cable is under tension when you bend over. 2) Bend at the waist while keeping your back and legs straight until your upper body it is almost parallel to the floor. 3) Using your hamstrings and back muscles, straighten your body back to the starting position. 1) Attach a rope to a low pulley. Hold each end of the rope with your palms facing each other. 2) Curl the rope upwards while contracting the biceps. Keep the elbows stationary and only move your forearms. 4) Slowly bring the rope back to the starting position. 1) Attach a rope to a high pulley and grab it with your hands at shoulder width and your palms facing down. 2) Standing with your elbows close to your body, use your triceps to bring the rope down until it touches the front of your thighs and your arms are fully extended. Keep your elbows stationary and only move your forearms. 3) After a short hold at the contracted position while you contract your triceps, bring the rope slowly up to the starting position. 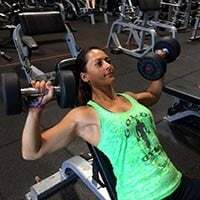 1) Sit on an incline bench (about 45 degrees) with a dumbbell in each hand.